Last thing to finish the main work on the coat is hemming the bottom. After deciding how long I want the coat, it being a compromise between being too long and tripping over it all the time (as I did with my Mk I - hell that was too long!) and ending up too short, I pin the hemline I want to have. I then press it along the hem to define the edge I will work to. 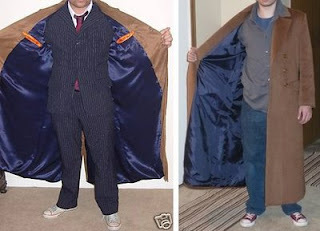 While I was researching The Competition’s Efforts, I noticed a couple of pictures showed people wearing their Tennant coats held open, to show the internal pockets. When they did this, the lining was hanging like a big bag and sagging badly in the middle (see left). I wanted to try and prevent this, so I sewed the lining’s vertical seam allowance to the seam allowance down the insides of the coat to support and secure it. I did this from around 6 inches below the armpit to 18 inches from the hem. This is a bit unconventional - I’m sure you aren’t supposed to do this, but it has also stabilized the position of the lining around the hem area, which I then found much easy to work with. The hem is then laid out flat and I cut the lining level with the seam allowance of the coat hem (see right). At this point I need to check the circumference of the the lining and the coat match. If there is any extra, I just slightly take the vertical lining seam in a bit. Then inside out, I sew the coat and lining together and do a little trick to create a neat hemline: I start the hem at the front of the coat, sewing along the pinned finished pressed edge; just as I go beyond the bottom of the lapel facing, I do a little shimmy, like a train changing tracks to then sew along the seam allowance around 5 to 10mm from the edge. (see below left). I then cut away the excessive seam allowance at the bottom of the lapel facing and cut a corner point like I did with the collar points in Turning The Other Collar (see above right). When this is turned the right way in it makes a nice neat hem, with the lining emerging from the hemline and expanding into a 1 inch depth which allows for some flexibility and give at the hem for the rest of its length. (see right). This picture was taken before the lining was pressed flat so you can see into the structure of the hem. I then do the same for the three other hem corners, leaving a short 4 or 5 inch gap in the hem where I have gained access. Through this gap I can insert a line of wonderweb to hold the seam allowance up inside the hem. This gap is then hand stitched closed to complete the hem. So - that’s it - all done! (though I just need to do the front buttonholes and go round tidying up any loose threads etc). I will get some decent pictures of me wearing the finished coat real soon, so watch out for them! This has been the most amazing journey and I am finally there. Trust you enjoyed following me along the way and hope it inspires you to pick up a needle and thread and have a go at some costume project of your own, no matter how small or large it maybe. It’s all about having fun doing it and the sense of satisfaction at the end of wearing your creation, regardless of how screen accurate it is or what others think - YOU made it! Congratulations on finishing your wonderful coat! Watching you work step-by-step on this project has been great fun and very educational. I really can't thank you enough for sharing it like this! Thanks so much for showing us this amazing thing you do. Do you think a girl could wear this coat? I've been told long coats, like pants, have gained that sort of status, but I REALLY LOVE IT! Hah, sorry for the caps, but it's such an awesome coat! Getting the collar right - at last! Panic over a seam I did not know about! Where do Time Lords keep their armies?